I spent a weekend with a three-year old and a one-year old and I did things I haven’t done in 25 years. No I did not fight over toys. I finger painted. And even though I was wearing a smock, I still managed to get paint all over my shirt. As the three-year old slammed her hand down in the paint, splattering it in every direction, I glanced to see if her mom, my friend, was watching and wondered if I could get away with that too. “Ok.” This sounds simple at first, but for a girl who has every Disney princess costume it is not. She becomes frustrated when she can’t find all the parts of the Cinderella costume. 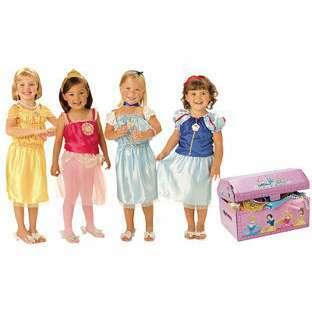 Do NOT confuse Cinderella’s princess accessories with Snow White’s. They are NOT interchangeable. This would be a dream come true for me if I were three feet tall and could actually fit into any of these ball gowns. I try to explain this. The three-year old is insistent. Then she hands me Belle’s child-size heels. I put three toes in each shoe. She starts pushing on my pinky toe. I do not have the photo or else I’d share it with you. I was in the yellow costume on the left. I swear.